On the steamy morning of July 7, 1777, Patriot and British troops clashed in Hubbardton, the only battle of the American Revolution fought on Vermont soil. While the Patriots were forced to retreat, the battle — with a 27% casualty and capture rate — is considered the beginning of the military end for British General John Burgoyne, who surrendered his entire army to the colonists in October. 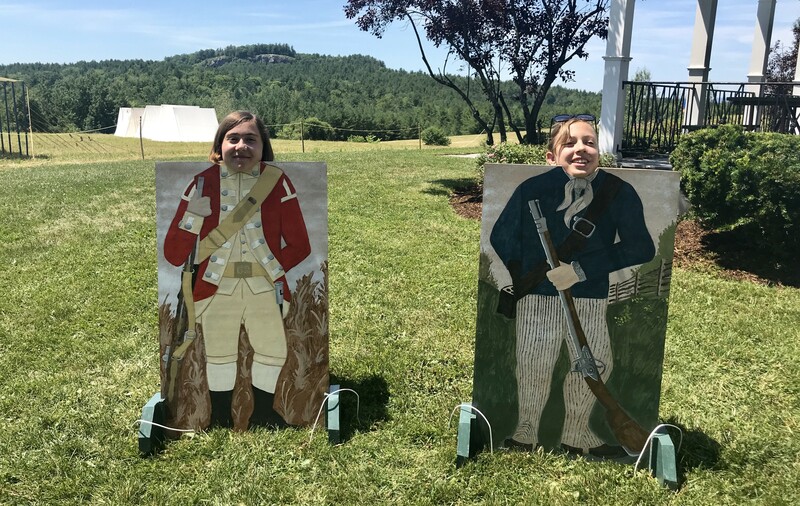 On an equally sultry morning, 241 years later, my friend and I, along with our 13-year-olds, Gabriela and Beatrix, packed up a picnic lunch and a thermos of iced coffee to visit the Hubbardton Battlefield during its Revolutionary War Encampment Weekend. Our girls — one a middleschooler at Hazen Union in Hardwick and the other a homeschooler — are Good Citizen Challenge participants and wanted to earn more points. A trip to the battlefield is worth 10 points; a visit during the Encampment Weekend earned an additional 20-point bonus. In the undeveloped grassy field, straight rows of inverted-V tents were pitched for the weekend at the steep hillside’s crest, with colonists on one side of the small visitor center museum and loyalists on the other. We arrived during the steamy mid-morning to find Revolutionary-era camp life was on full display. We first met a woman who showed us a long-sleeved, ankle-length linen dress she had hand-stitched. Tucked in her apron for safekeeping was a wooden vial of precious silver sewing needles, a pair of small scissors and a pincushion. In the historically based story she had developed over numerous re-enactments, she had been widowed and was now following the army as a seamstress-for-hire. We took our time walking through the rows of tents. One woman washed clothes in a soot-stained kettle over a smoldering wood fire. Some men lay sleeping in the grass, while others ate from wooden bowls and chatted around campfires, wearing knickers, knitted socks, three-cornered hats and wire-rimmed spectacles. On vendor row, we chatted with the maker of pewter buttons and admired iron candlesticks and handmade wooden furniture — but didn't end up buying anything. Cooling down beneath a maple tree, we listened to Laura Grzybowski of Peters’ Corps — a group of loyalist reenactors who participate in living history events from Virginia to Canada. Grzybowski, wearing a bonnet and apron-covered dress, acknowledged the 18th-century colonies’ patriarchy, but emphasized the role of women was understated and “hugely important — really vital” to both sides. In addition to the significant labor performed by women — including washing, cooking and sewing — men benefitted from having their families nearby, rather than worrying about the uncertainty of their welfare at home. 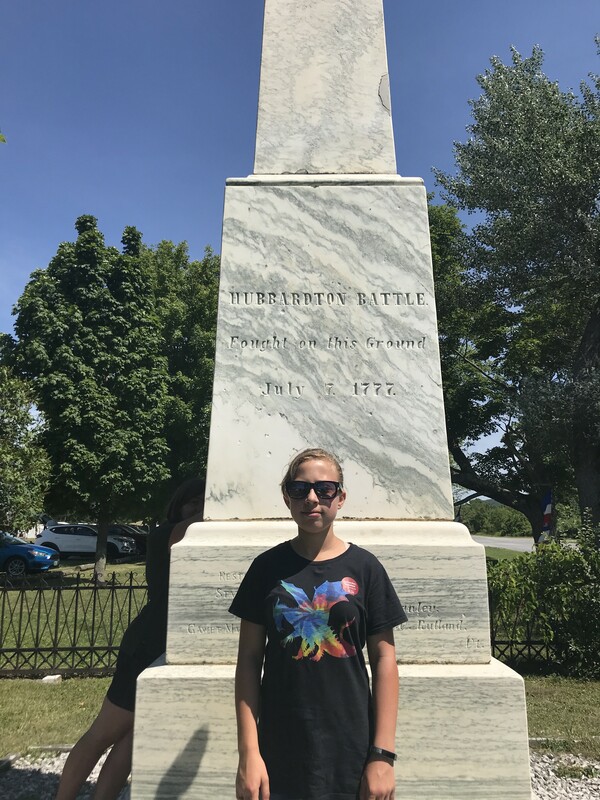 We left the battlefield under sunny skies and took our time driving home, stopping in at The Vermont Book Shop in Middlebury and cooling down with homemade sweets at Stowe Ice Cream. To end the day, we swam in the neighbors’ pond. In the sunshine, with fireflies darting around, I reminded my daughter how fortunate we are to live in peaceful Vermont. For more Revolutionary War events, check out Bennington Battle Day Weekend on August 16-19. 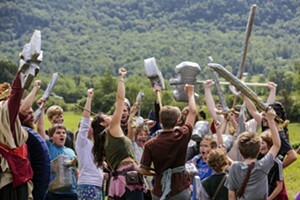 Town-wide events include a Living History Encampment and a fashion show featuring reproductions of historical clothing.